Ride with the DC Snowboards Pro Team at Big Bolder Park on Dec 6. 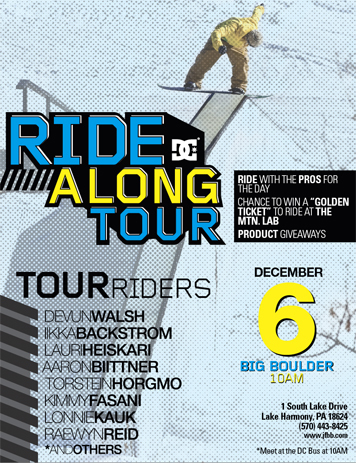 Win a “Golden Ticket” to ride at the Mountain Lab, Free Product Giveaways, etc. DC Pro Team: Devun Walsh, Ikka Backstrom, Laui Heiskari, Aaron Bittner, Torstein Horgmo, Kimmy Fasani, Lonnie Kauk, Raewyn Reid.